Relief from back pain depends on the cause and type of back pain. Back pain can be broken down into two distinct categories: acute pain and chronic pain. When people are affected with acute back pain they often feel it affecting a localized region of the back, or they feel a radiating pain that extends down one of the lower extremities, which is known as sciatica. However, acute back pain can often be a symptom of a larger spinal issue and, left untreated, can worsen over time. When a person experiences an episode of acute back pain, it is usually the result of a chronic back problem or degenerative condition such as osteoarthritis, osteoporosis, degenerative spinal discs, or advancing poor posture. These chronic conditions can lead to spinal instability, motion loss, muscle weakness, and poor fitness. Simple bending movements or strenuous activities challenge the structures within your back and can cause soft tissue inflammation, and pinched nerves. Over time these small micro-traumas will lead to pain and cause disability. The treatment approach for a acute back lower back pain is mostly guided to reduce muscle spasms and inflammation. 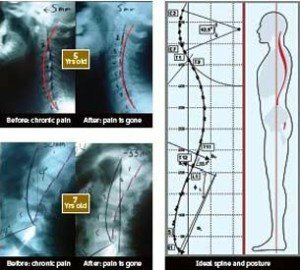 The spine is typically guarding itself in the acute phase and treatment must be treated in a organized and specific manner. Once lower back pain relief therapy is administered it generally takes anywhere from 3 to 6 therapy sessions to treat. Once the acute condition has been managed and symptoms have improved, corrective therapy can begin. Whether you are seeking exercises to gain back stability or to help alleviate back pain, it is essential to get evaluated prior to starting a corrective exercise program. It is always important to consult with a medical professional when trying to promote spinal stability, and/or to alleviate pain, to ensure that further injury is not caused. Furthermore, having an open dialogue with a professional in the field will not only provide you with knowledge and details of your treatment protocol, but it also will allow your medical professional to tailor a treatment regimen that is specific to your needs. Fully understanding the details and how to manage your condition will always result in a better treatment experience and outcome. Below we will cover some of the most frequently seen conditions in our office, and we will discuss some do’s and don’ts when it comes to back care and exercise. What Is Hyper Lordosis (Swayback)? Hyperlordosis, also known as swayback, is a condition that involves an excessive curvature of the neck and lower spine. A healthy spine should possess three natural curves between the neck and the lower back. These curvatures in the spine help to absorb shock and also help to support the head during static and physical activities. However, when an over curvature in the spine occurs, it places excessive pressure on the spine which can lead to arthritis, disc herniation, and pinched nerves. Individuals with Hyper Lordosis often have a visible arch or “sway” in their lower back, and the shoulders appear to lay behind the hip joint when looked at vertically. Individuals who have Hyper Lordosis may have difficulty resting on their back due to pain. Our flexibility, mobility, activity, and posture depend on the health of the spine and the tissues surrounding it. Getting treatment to help correct the over curvature helps to prevent complications later in life, such as arthritis and chronic back pain. This condition if addressed earlier in life is much easy to fix as the joints of the spine are more malleable. Treatment for lordosis will depend on the severity of the curvature and the presence of other symptoms. X-Rays are ofter necessary to determine the right treatment protocols. This will allow a treatment protocol that is tailored for the individual in need of spinal correction. The spine is responsible for much of our movement and flexibility, it is important to maintain a healthy spine. There are three types of abnormal kyphosis: postural, Scheuermann’s, and congenital. Physical therapy and exercise are often effective in postural and Scheuermann’s kyphosis. Surgery is recommended for congenital kyphosis and more severe cases of Scheuermann’s kyphosis. The picture to the left illustrates a decreased lumbar lordosis. 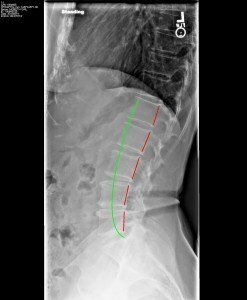 The elliptical green line represents normal positioning of a lumbar spinal curvature. 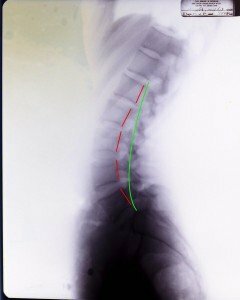 The redline indicates the actual spinal curvature of the patient. The redline loses the normal elliptical curve that should be present in a healthy back. There are three main types of kyphosis: postural, Scheuermann’s, and congenital. Most cases of kyphosis do not require any treatment. The spine has a series of normal curves when viewed from the side. These curves help to better absorb the forces applied to this spine from walking, jumping, in bending. Your neck and lower back have a normal inward curvature while you’re spine between the shoulder blades has a normal outward curvature known as kyphotic curve. The spine has a series of normal curves when viewed from the side. These curves help to better absorb the loads applied to the spine from the weight of the body. The cervical spine (neck) and lumbar spine (lower back) are have a normal inward curvature that is medically referred to as lordosis or “lordotic” curvature by which the spine is bent backward. The thoracic spine (upper back) has a normal outward curvature that is medically referred to as kyphosis or the “kyphotic” curve by which the spine is bent forward. In this discussion, the term kyphosis will be used to discuss abnormal kyphosis. Untreated abnormal kyphosis from an anatomical standpoint will put stress on the anterior portions of the disks. If this problem is not addressed bone spurs will begin to develop on the anterior surfaces of the vertebras. This will decrease range of motion and cause pain and discomfort. The spinal disks will begin to protrude posteriorly and may impact the spinal cord causing spinal cord compression and radiculopathy. Since the weight of the body is in a more anterior position the body will abnormally begin to hunch forward. The body will begin to loose its natural height, a hunch will begin to develop in the lower neck and upper back region.